Have you failed at trying to control your weight? Are you sick of counting calories, carbohydrates, fat grams, or food group points to no avail? Today’s your lucky day! There’s something new on the horizon for people who are unhappy with their bodies …. now you can change your height — as long as you follow these 15 easy steps, you can achieve the 5ft 6 or 6 ft 2 body you’ve always dreamed of having. 15 Simple Tips To Control Your Height! It’s true. We’ve been misusing those nifty height/weight charts all this time. They actually work in reverse. 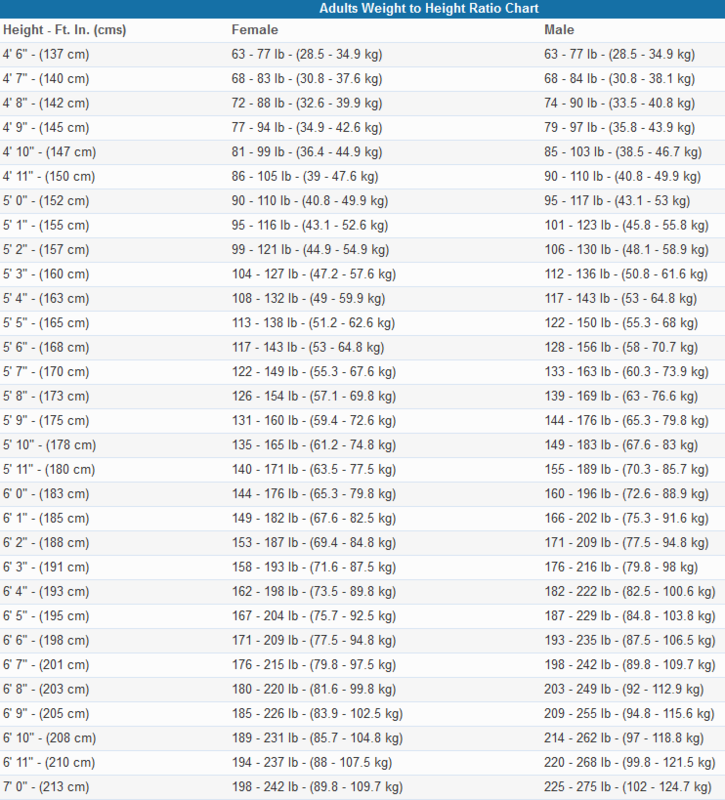 Find your current weight on the (minuscule) chart above and then look directly next to it to see how tall someone within that given weight range should be. There. Got it? That’s your goal height! Ready? Now throw away your bathroom scale. There’s something far less cumbersome (than an ugly hunk of steel you step on) for you to track your progress with. A graceful, slender measuring tape. Hang one up on any bare wall. Stand next to either the side with inches or centimeters and smoosh your hair flat against your head with a hardcover book, (preferably my novel “Lullabies & Alibis” which is made expressly with this purpose in mind) and make a mark with your pencil so you can see your beginning height clear as day. No cheating by standing on tiptoes or slouching. Figure out if you should become shorter or taller. If you’re already satisfied with your height, you can advance to changing your shoe size using a convenient feet-binding method which will be the subject of a future blog. Doorways! Have you only been using them to transition from your kitchen to your den to your bathroom? Silly you! Grab onto the framed molding above the door and let your entire body hang there for three minutes. Do this every single time you enter or exit any room. Mindful suspension is the key. Always focus on the sensations in your body as you just dangle, so you can stay in the present moment. If you pass through a door but don’t feel like using it as a body-stretcher, it probably means you are stressed or aren’t coping well with some important life issue and a good therapist should be able to help you so you won’t be someone who just views doorways as a method to advance through your entire house. We call that being an “Emotional Home Roamer.” People like that just use doorways as handy portals instead of the Height Shifters they were designed to be. Look at actors in the movies or models in magazines and see where the tops of their heads reach, relative to objects such as wall clocks, flatscreen televisions, or other people standing nearby. Tape a photo (of someone who is as tall or as short as you desire to be) on each and every door knob in your home. This visual reminder will cause you to admire and possibly envy them, but it will certainly motivate you to want to achieve your goal when you pass by and see a person of your ideal height. Note: If you want to become shorter instead of taller, simply reverse the process described in step #5. Be sure and only stand next to the measuring tape every morning when you first awaken, before the ceiling in your home can distort your height. This will give you a true and accurate number of your improved stature. For every millimeter your height changes, reward yourself for all your hard work and great effort, but make sure it’s not something that will add on inches. i.e. Avoid treats such as hats, high-heeled shoes, hair ornaments used to create updos, and especially pride, as that could make anyone walk around feeling 10 ft tall. Bingeing on things with measurements will also slow your progress and you’ll be back to square one. That includes inchworms, a “tall” glass of water, a foot-long sub sandwich, or even an old fashioned wooden ruler which should only be used for rapping the knuckles of unruly children. Don’t partake in these things! Galleries! It’s all about Galleries in and Galleries out. If you take in more (art) galleries than you exorcise (think spinning your head around 360 degrees like Linda Blair in that scary movie) you will not get any taller or shorter and you could be destined to remain at the same height your DNA blueprint dictates for your entire life. Avoid Curbs! Rice, pasta, bread, and potatoes are all fine. But if you indulge in curbs, your height is liable to change suddenly AND dramatically. If you don’t believe me, go on a date with someone and let them walk in the gutter or the street whilst you stroll along on the curb. You can no longer gaze into each other eyes. Forget having “Curb Appeal.” Curbs are the enemy! A high “Pro-Teen” regimen also has a lot to offer in this process, so don’t be against kids between the ages of 13-18. They will keep you full longer which brings more satisfaction, they are harder to digest, and thus will keep you busy with their loud music and disrespectful attitudes between your door-hanging sessions. Diets do NOT work. But our societal “Diet Culture” (lately disguised as “a Wellness Lifestyle Change” with “Clean Eating” and “Juice Fasts” etc.) is insidious and will keep you imprisoned in the vicious cycle of trying over and over again. This is a real advertisement from 100 years ago when “We” decided that being “plump” was better! Are we really going to let the whims of the media dictate what’s best for us? I’m finally completely cured from my bulimic behaviors now and if you’re interested in a post detailing the way that miracle finally happened, leave me a comment. I promise it doesn’t involve buying a thing. I just want everyone to obtain the freedom to feel good in their own skin. I have my life back now. Body Acceptance!! Embrace body positivity and diversity in ALL sizes. It’s the only way. Let’s dictate THAT for a change!